Exciting news for Radio Theatre fans! If you’ve been following us on a regular basis, then you know we’re Adventures in Odyssey fans and die-hards of Focus on the Family’s Radio Theatre productions. And we occasionally like to keep you guys informed about new productions from the award-winning team. Mere Christianity, one of the greatest Christian books of the twentieth century, was created as a series of radio broadcasts in a time of great conflict and adversity. England had gone to war with Germany. It was a time of strain, heartbreak, and weariness. The leaders at the BBC knew the nation needed a moral underpinning to face the crisis and embarked on an aggressive program to provide it. So they commissioned some of the greatest Christian minds to step up. C.S. Lewis agreed to help, resulting in the now-famous Broadcast Talks that became Mere Christianity. 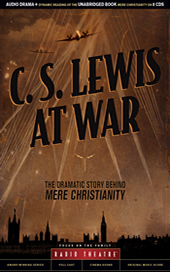 This behind-the-scenes drama integrates the ideas Lewis explored in Mere Christianity with the very real impact of living out a Christian life in a period of trauma: the conflicts pressed hard against the times of grace, compassion, the love of Christ shown to neighbors, and the reasons to trust in God when the world screams otherwise. This Radio Theatre production also touches on the essentials the faith and worldview, not merely as an academic exercise, but as a true life experience. You can learn more about the latest Radio Theatre audio dramatization, see a video promo, and hear samples at radiotheatre.org. Don’t miss out on your copy!